Syracuse forward Elijah Hughes (4) goes up for a layup during the first half. Mandatory Photo Credit: Kicia Sears, The Juice Online. One game after Syracuse forward Elijah Hughes scored just four points against Cornell, he had a much needed comeback game as the Orange routed Northeastern 72-49 on Tuesday night at the Carrier Dome. Hughes percolated early, draining his first attempt, a 3-pointer in the opening minute of the game for SU’s first basket. Several minutes later, Frank Howard picked Anthony Green’s pocket and fed a streaking Hughes, who absorbed contact from Tomas Murphy to hit a layup plus a foul. With 13:36 to go before intermission, Howard again found Hughes, who sank another shot from beyond the arc, officially snapping him out of the doldrums. That’s exactly what happened, as Hughes finished with 17 points, four rebounds and three assists. Hughes and Oshae Brissett (21 points) paced the Orange in one of their most complete efforts of the season. Syracuse’s offensive woes from the first four games have mostly passed since the return of point guard Frank Howard. The Orange assisted on 20 of its 26 baskets, a season high in assists to field goals made ratio. The Orange had come in at less than 50 percent in that category. 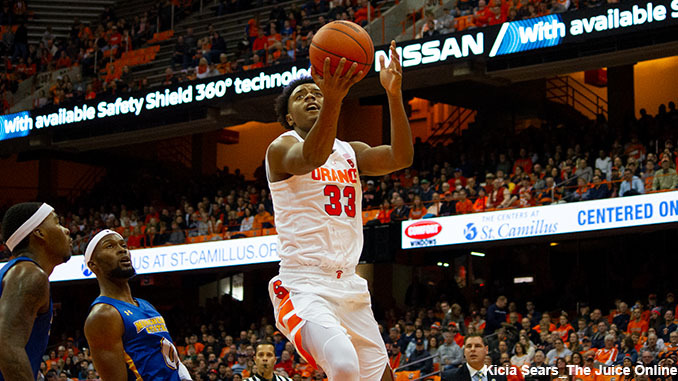 That proved to be more than enough to make up for an off night from SU’s leading scorer, Tyus Battle. Battle had a game to forget, getting his first two points with 15:12 to go in the second half. He would finish with that lone field goal. On Tuesday, one of those ‘other guys’ was Hughes.